And, last, but not least, the pin container. A pin container you might ask .... Yep. Mine is a little white condiment bowl. In patterns, I find an amazing number of sewing pins that were obviously used for littler alternations here and there. And then, when the seamstress is finished, they remain with the pattern; holed up in the envelope. These pins fall into two categories ... the Perfectly Fine (which go into the little condiment bowl) and the ones that have been in the envelope for a really long time, The Rusted. The Rusted ones go to the trash container. 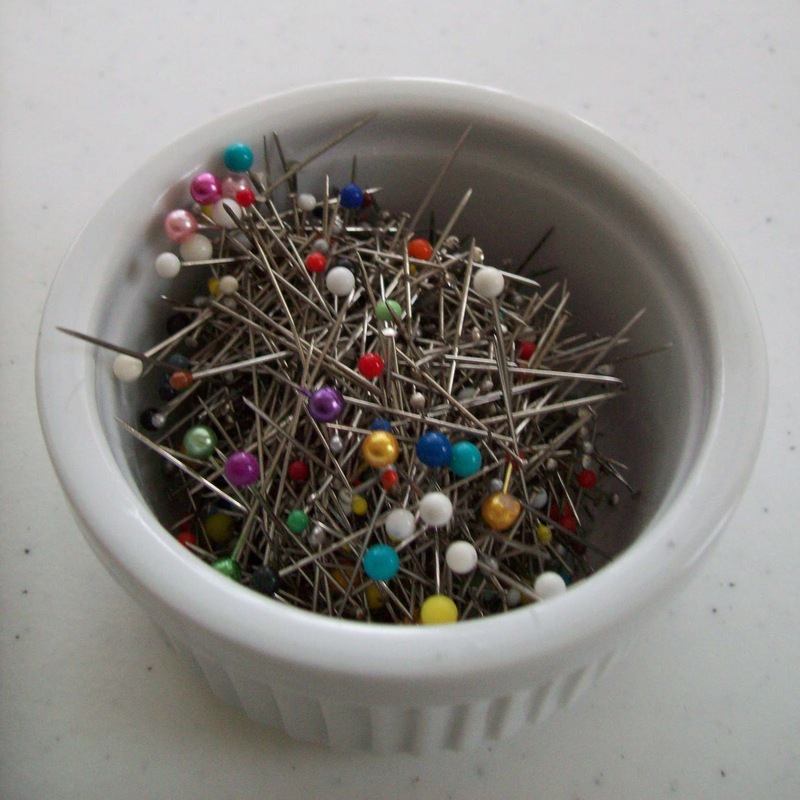 In the beginning, I put the pins in my pincushion, which quickly became very full, and I adopted a second pincushion. Well, I certainly didn't need more, and that was the originating point of the white condiment bowl. I've been collecting this particular set of pins for about 2 months. 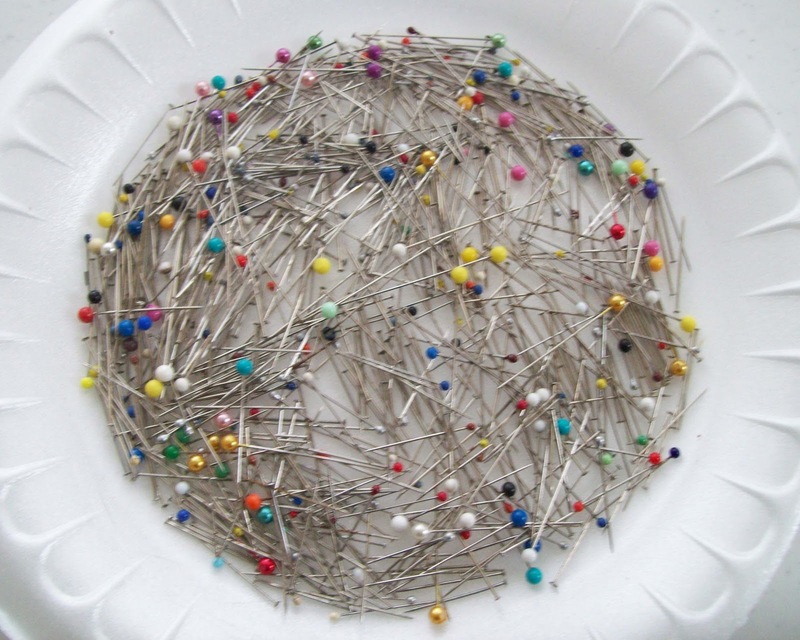 Apparently, sewing pins are dispensable. I found myself wondering it this is due to the low cost factor, or, more of a fact that the seamstress is anxious to move from the cutting to the sewing process and just doesn't want to take the time to remove them. I know, if I'd get past the thinking about sewing, and start sewing, I might find this out myself. So, what do I do with them .... I typically give them away. The last set went to an unexpecting customer. She ordered multiple patterns and sent a note saying she was teaching a group of young teens to sew. Thought she might need some pins, so I included them in the package. I never did hear anything, so don't know what she thought when she opened her package ... 6 patterns and about 300 sewing pins. 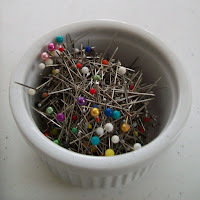 So, in the future, if you happen to need any sewing pins, just send me a note with your order and I'll empty out my bowl.